When you create fairy drawings similar to the examples here, you can expect to develop images that have a sense of mischief and fun. Fairies love to hide your possessions so if you are missing items that you know have not left the house, well, those cheeky little beings must have taken them! It sure explains a lot about things we've lost over the years, doesn't it? Farmers even blame these impish sprites for stealing the milk when a cow goes dry. 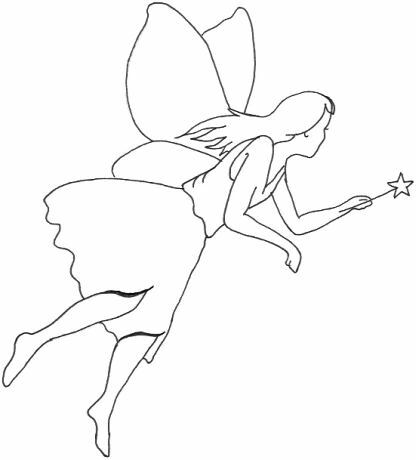 You can use the outline below for assistance to create some fairy pictures. When you fill in the background, you have the option to place some hidden treasure in there to make it more intriguing to your viewing audience. You are also entertained during this type of creative activity. I discovered that drawing fantasy figures is not an easy task when you are a learner drawer but if you keep it simple, you can achieve anything. I did this pen ink fairy drawing using a point 4 felt tip pen. Using ink doesn't leave any room for errors so (at this early stage) I mainly use it to carefully go over an image that I first make with a light pencil. All you really need is a good starting point and once you get the hang of it, you become more confident every time you practice. A fairy has magical powers and she can use them for good or bad deeds. Fairies can make themselves invisible to humans. There are several types of fairies including elves, leprechauns, sprites and pixies to name just a few. They are mentioned in two kinds of folk stories - legends and fairy tales. Legends are from real life and fairy tales are from an imaginary land. A fairy is mischievous and we usually blame them for any wrongdoing that is inexpicable in our daily lives. The main belief is that fairies are good. Most fairies have beautiful features and mainly wear white. So basically, she is a pretty female being with wings. Fairyland is thought to be ruled by a king and a queen and their kingdom exists underground. People who believe in fairies pour milk into the ground for good luck because it is said they love milk. There is a different fairy legend that you might like to know about and you can find it in the discussion about the fairy ring of mushrooms. I had other fairy drawings lined up to show you, but I just wasn't happy with them. Since I have only been drawing for about one year, these drawings are what I have managed to achieve so far. I hope this encourages you to see what you can produce - I certainly don't mind if you progress faster than I do, in fact I will be thrilled about that! The thing is, I know if I keep practicing, I will definitely improve. This is one image that I completely dislike but considering it was my interpretation from an ornament, it proved to me that I wasn't totally dependent on copying other drawings. Initially, that was a small worry I had but I managed to banish it with this experimental drawing. When you consider that I drew these fairies when I was just starting to draw, it demonstrates to you what you can achieve if you are willing to try. ... Update - here is another pencil drawing of a fairy. Find an outline on that page too, plus some extra drawings in pencil. 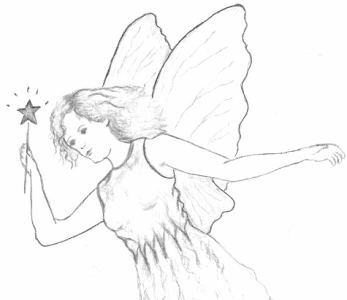 Have you seen my new gallery of pencil sketches which also includes a sketch of a fairy? 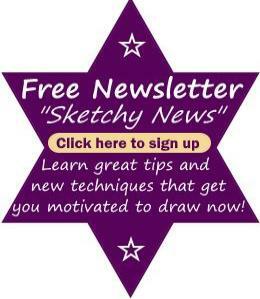 Sketching is a simplified form of drawing that takes less time so artists can get their thoughts on to paper quickly. 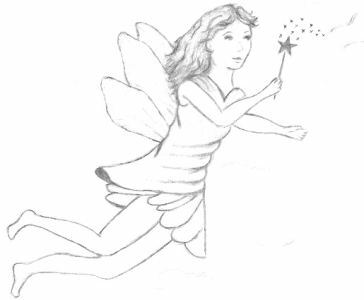 I hope this information inspires you to get creative with your fantasy drawings of fairies. I look forward to sketching fairies and hiding treasure amongst foliage or whatever. As an aside to purposely hiding objects, I really enjoy finding unexpected images within a sketch so keep watch for things that magically (or unintentionally) appear within your artwork - it's such good entertainment! I know that every bit of practice leads to improvement and I can hardly wait to see what my next creation will reveal. Please join in with me, I am living proof that anyone can draw and it only takes a tiny effort.